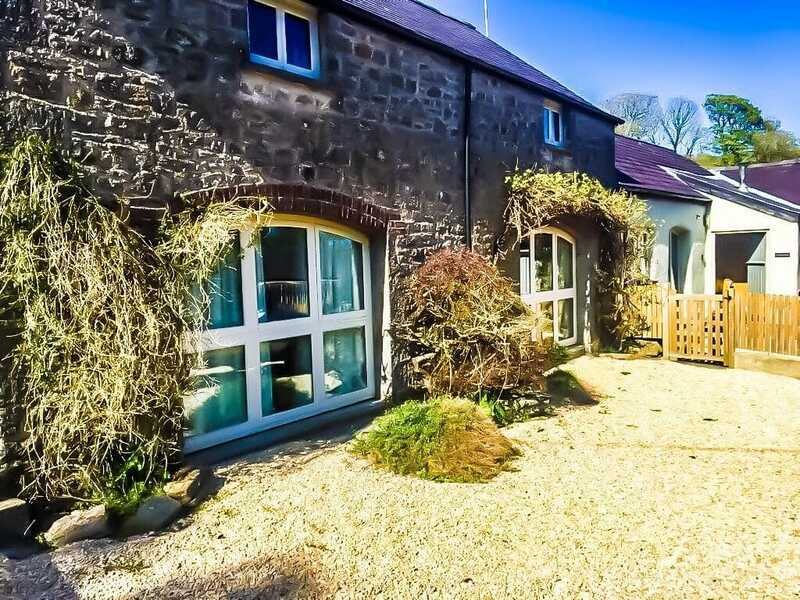 Blessed with the prospect of rare sunshine over the May bank holiday and the chance of a short break in the breath taking country side of Pembrokeshire, meant that I was only too happy to oblige when Mini Travellers asked me to review Arch Barn, courtesy of Coastal Cottages. I have never been to the county of Pembrokeshire before, my previous visits to Wales were to Northern Peninsula’s Abersoch and Pwllheli. I was therefore intrigued by the opportunity to explore a place made famous for its many sandy beaches, bays, stunning countryside and pretty villages. Early Sunday morning my mother, eight month old baby, two year old son and I bundled into the car to commence our journey from Rochdale to South West Wales. After a six hour drive we were only too glad to have finally arrived at the charming Arch Barn. Surrounded by rolling countryside Arch Barn makes up one of four properties and is located down a private lane towards St Twynnells. Arch Barn is a long walk from the main road with children and there are no pavements for prams or amenities nearby so a car is a must if you want to get anywhere with your little ones. On arrival we were greeted by the neighbours dog Bert, a friendly little chap who gave us a warm welcome and instantly made us regret not bringing our own, much loved four legged friend. Arch Barn welcomes dogs and on day one Bert showed us where the dog treats were kept in the kitchen. A wine hamper, part of Coastal Cottages concierge service was also to be found in the kitchen. Worth investigating this service as it makes for a lovely arrival. Our first impression of Arch Barn was one of delight, with a lovely outside patio garden/ dining area and views of the surrounding countryside we were glad we would be able to enjoy the early May sunshine in style. 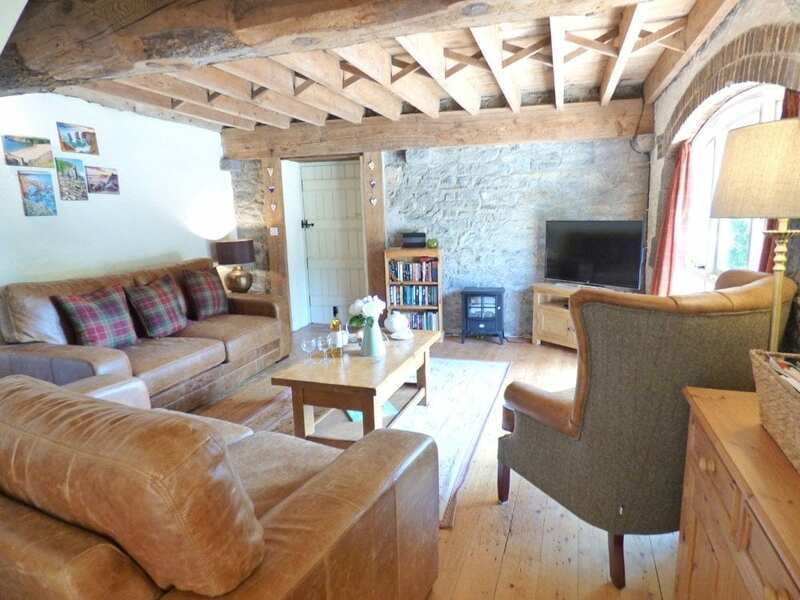 Arch Barn is a charming 4 star, three bedroomed barn conversion which has been fully modernised and tastefully furnished to making it both comfortable and luxurious. The lounge had plenty of space to relax and rest during our stay and boasted huge sofas, exposed stone work and a stove. The large farmhouse style dining kitchen was well equipped with everything you could possibly need to make it very much a home from home. Plastic cups, bowls, plates and cutlery meant we need not have brought our own and a highchair was provided. The bedrooms were spacious and the beds were large and very comfortable which meant we all got a good night’s sleep and woke up the next morning feeling refreshed. Our two year old was also very happy when he found a large box of toys behind the sofa which kept him occupied for a good while. Upstairs in the twin bedroom there was a great selection of children’s books so even if we had decided to just stay and relax at the barn all day we would have plenty of options to keep our little ones entertained. 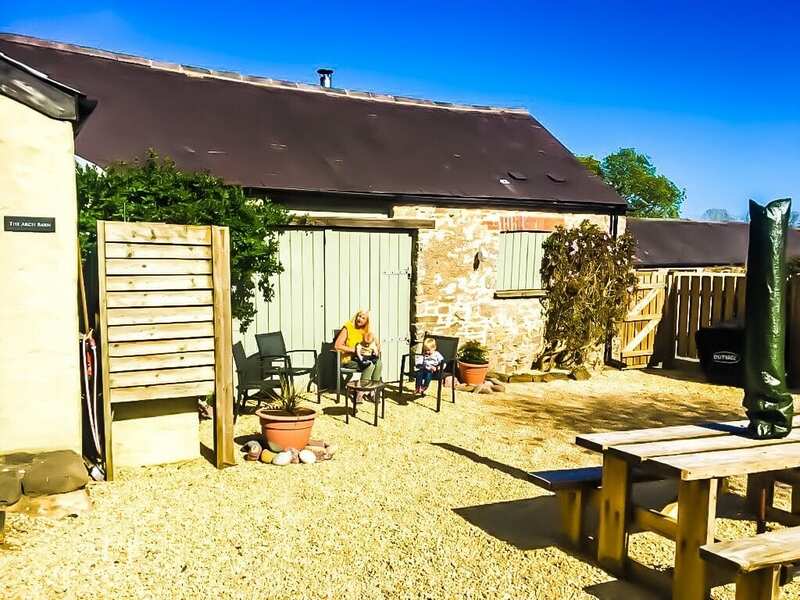 Arch Barn also boasts a large gated patio and dining area which can be accessed from the kitchen through French doors, being an ideal place for our toddler to play*. It’s also worth mentioning in case you become alarmed as we did that gunfire can be heard at certain times from the nearby Castle Martin army training base which is a short distance away. 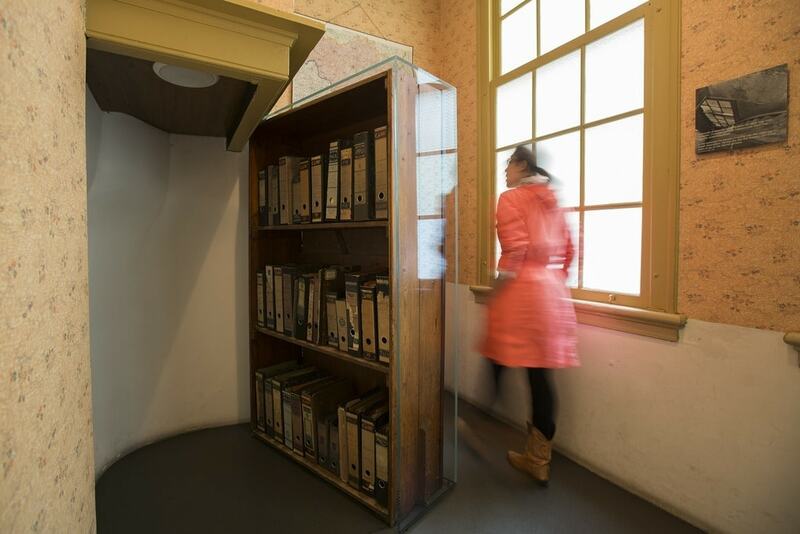 You may have already seen this as it’s included in the website information but we hadn’t noticed it. On our first day we decided to take a twenty five mile round trip into Tenby a popular Victorian seaside town. 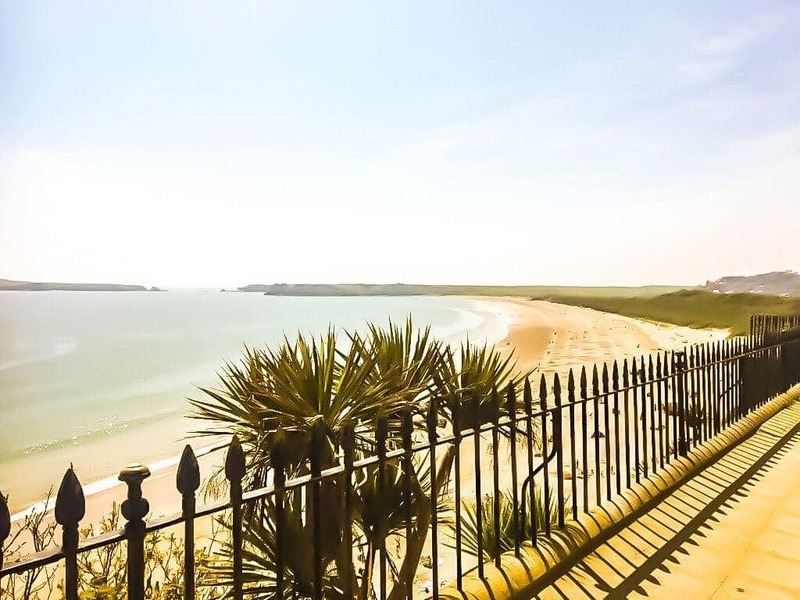 There are many lovely beaches nearer to Arch Barn but we thought going to Tenby would be a good opportunity to stock up on essentials from the many amenities the town has to offer. 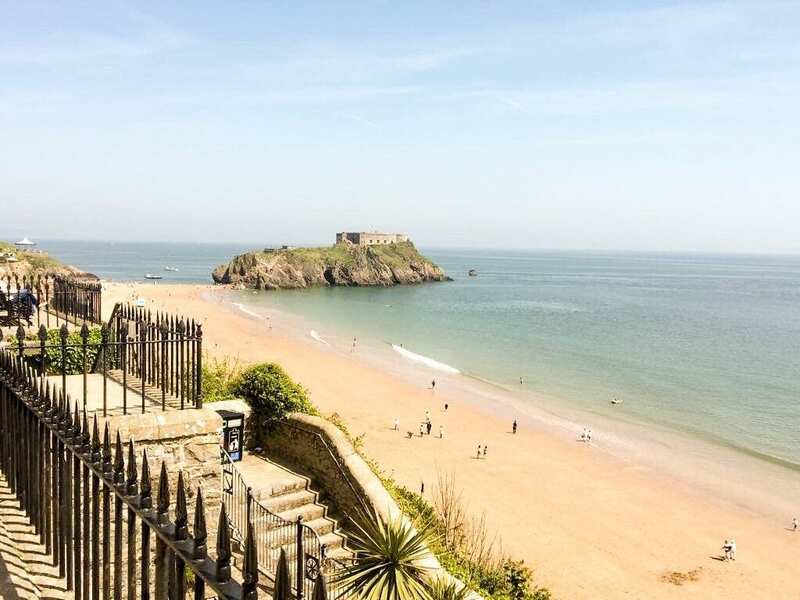 Tenby is really quite charming with its quaint narrow lanes which are filled with cafes, restaurants and shops, it’s commercialised but still manages to maintain a quaint seaside feel with its pretty pastel shaded houses and medieval town walls. On arriving in Tenby we easily got parked a short walk from the centre paying just £4 pound for the entire day. We then relaxed on Tenby’s South beach and paddled in the cool sea before heading up the steep path to buy lunch from a hot sandwich van. We ate our salads and sandwiches on deck chairs overlooking the sea surrounded by the hustle and bustle of excited holidaymakers and the laughter of children. 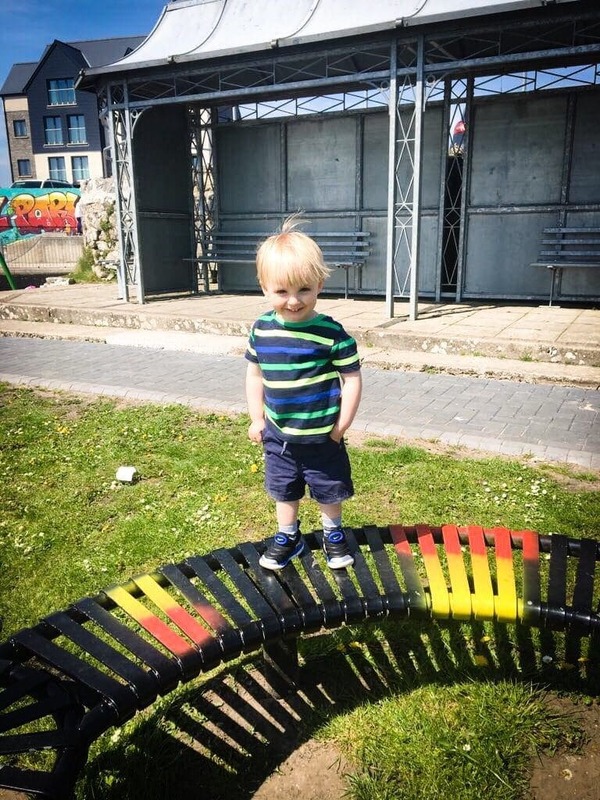 After lunch we visited a toddler and play park which overlooked the bay then headed into the town for a stroll around the shops, stopping to buy a few essentials from Tesco Express before heading back to the lovely Arch Barn for the evening. On our second day we decided to go to Folly Farm. Coastal cottages had very kindly arranged free passes for us and after a bit of a performance getting there, (our satellite navigation just couldn’t locate it) Folly Farm was well worth a visit as it was perfect for young children. 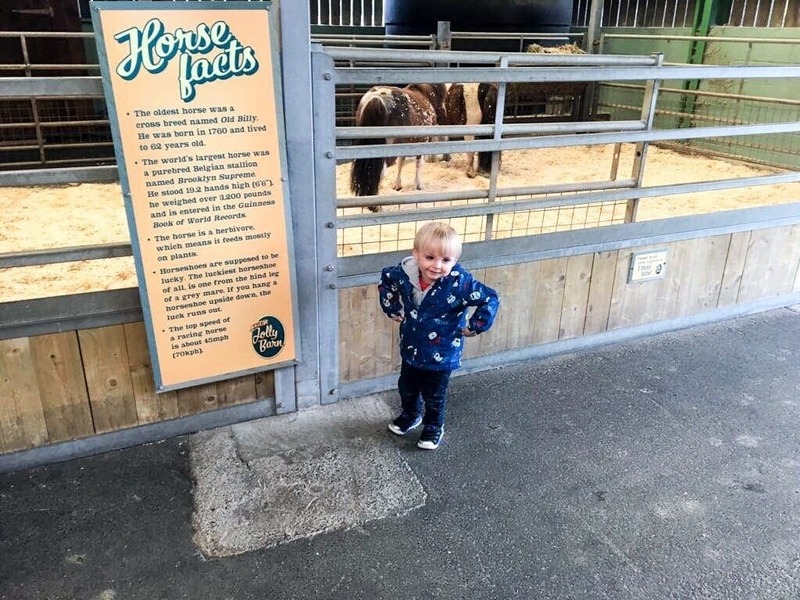 Situated twenty miles from Arch Barn along the A477, Folly Farm is an ideal family day out come rain or shine as many of the attraction are under cover. The huge barn is filled with animals including ferrets, mice and at various times cows can be milked and animals petted. There is a vintage theme throughout the park with an indoor fun fair including carousels, restaurant, theatre and soft play area. Outside there is a zoo which houses, penguins, lions, wallabies and much more, there are also several outside play areas geared towards older children and some lovely spots to have a picnic. My two year old particularly liked the reptile, spider and bird house as he could really scrutinise them in their glass cases. The staff were also very helpful and friendly and there were many amenities on sight such as gift shop, indoor eating area and coffee shop. 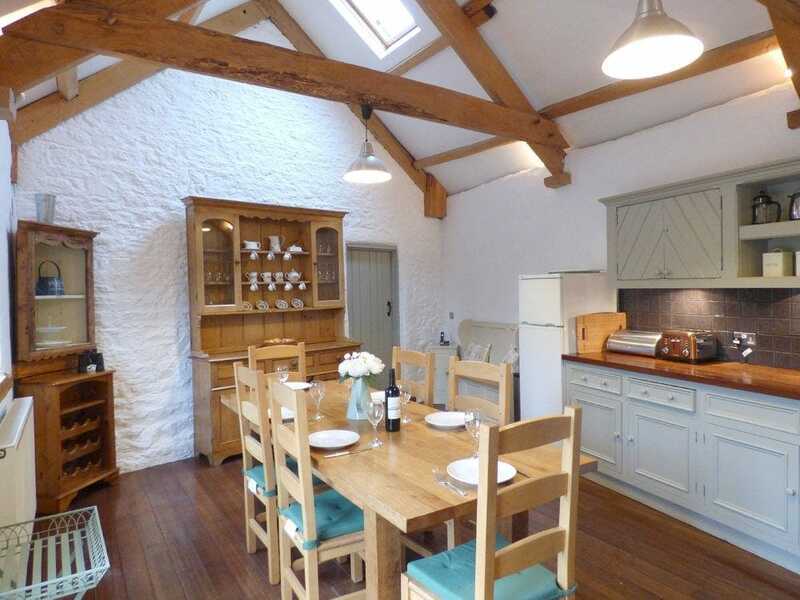 I would certainly recommend Arch Barn as it’s perfectly located for exploring Pembrokeshire. There are plenty of things nearby that regrettably we just didn’t get chance to do during our short stay, I would really have liked to have visited Stackpole Estate and Pembroke Castle and the beaches which are close to Arch Barn sounded truly beautiful. 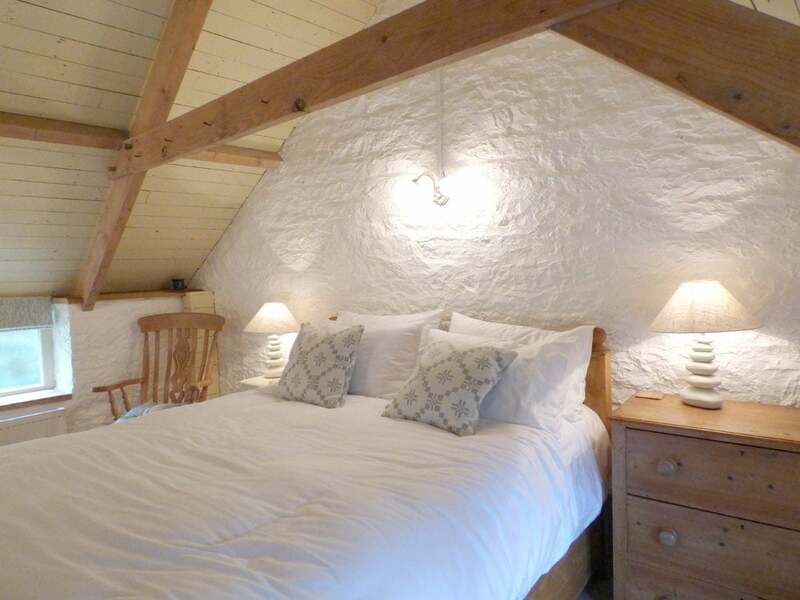 If you want to be surrounded by stunning countryside and be able to explore quaint villages and quiet tranquil beaches then Arch Barn is most certainly an ideal place to stay. We would most definitely look at booking through coastal cottages again as their hospitality and warm welcome were fantastic. 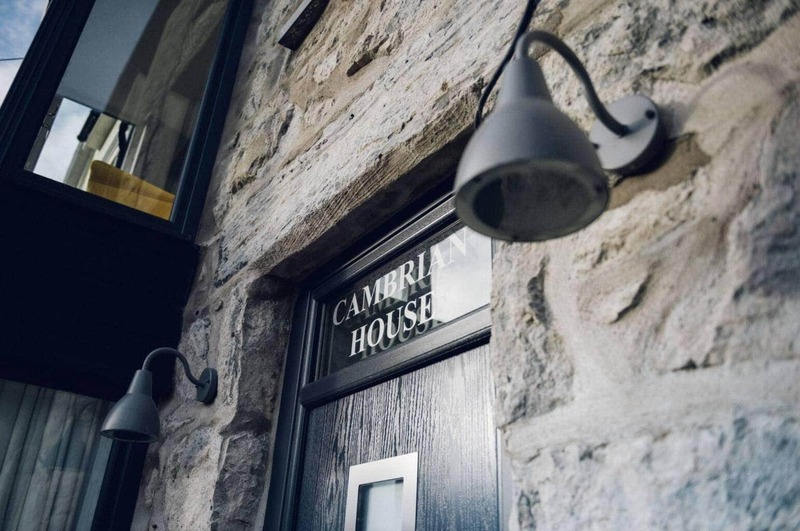 *During our stay there was a wasps nest in the courtyard which meant that eating outside wasn’t going to be an option which was a little disappointing given the lovely weather we were having. This issue has now been resolved by the owners and if you experience anything similar do call them immediately and I’m advised they will resolve it straight away. Previous Post Spend your Summer in St Berts Clothing - Win a Star Hoodie and a T-Shirt of your Choice! Pembrokeshire is somewhere we’d love to visit. That beach looks stunning! 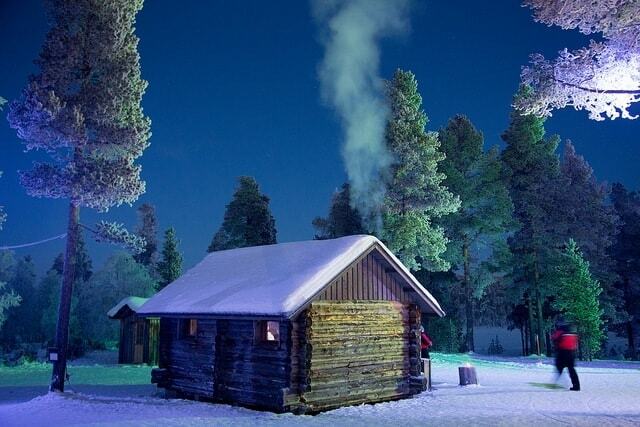 Looks a fabulous place to stay!